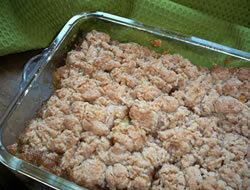 Preheat oven to 375 degrees F. Spread apples into a 9x13 inch cake pan. 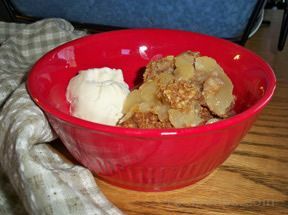 Blend butter, brown sugar, flour, oatmeal, cinnamon and nutmeg until crumbly and spread over the apples. 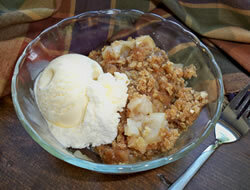 Bake for 30-35 minutes or until apples are tender and topping is golden brown. TIP: If peeling your own apples, you can keep them from getting brown by putting them in a mixture of 1/4 cup lemon juice to 1 quart of cold water.